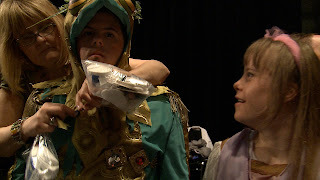 The Frog Princes is so big-hearted you wish it had more to say than “way to go.” Copping its framing device from Rushmore, the film shadows a theatre troupe over a few months as it prepares for its debut performance of The Frog and the Princess. The hook is that the performers all have developmental disabilities, and are part of an initiative headed by Stephen Snow, a psychotherapist who teaches drama therapy at Concordia. “Steve” to his players, Snow comes across as an amiable guy whose high standards inspire self-confidence and a good work ethic in people from whom society shamefully expects little. There’s joy in seeing actors like cutely named Ray-Man, a young man with Down Syndrome, channel their untapped self-confidence into something tangible. Ray-Man makes a sharp contrast with Tanya, a clinically depressed woman with Prader-Willi Syndrome, whose nastiness and frequent minor meltdowns give the film a welcome edge whenever she’s onscreen.